What child doesn’t like pizza? Mine! I’m continually perplexed that the even the smell of pizza doesn’t excite my kids. However, I’ve discovered that pizza in muffin-form is a gazillion times more interesting and fun. This muffin doesn’t ooze or drip. The melted cheese on top looks like frosting on a cupcake. Try adding chopped mushrooms, onion, peppers, or sardines to the batter. Eat these muffins hot or cold. Serve for lunch or snack with a side of spaghetti or pizza sauce for dipping. 1. Preheat oven to 375 degrees. Grease muffin cups with olive oil or cooking spray or line with paper liners. 2. In a large bowl, combine flour, baking powder, baking soda, salt, basil, oregano, and sugar. Stir well until blended. 3. Mix in tomatoes and 1 1/2 cups of cheese. 4. In another bowl, beat egg, whisk in buttermilk, and stir until combined. 5. Spoon batter into prepared muffin cups until half full. 6. 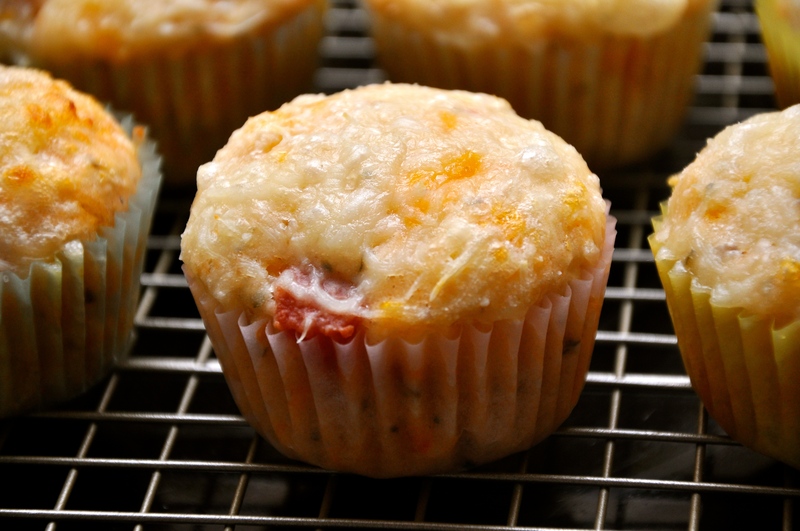 Sprinkle remaining 1 cup cheese on top of muffins. 7. Bake for 15-20 minutes, until a toothpick inserted into center of muffins comes out clean.